The Christmas season is a fine time of year to reflect on that for which we are most thankful. Days before Christmas I received a gift in the mail from a boy whom I had taught as a sixth grader two years ago. Because I just recently retired, this was the first year in thirty-nine years that I have not been in school to share the spirit of the season. Brendanʼs gift could not have been more timely. It was originally intended to be a retirement gift. On the final day of school, he had told me he was sorry he cold not find the gift he wanted to present to me. I felt the contents of the envelope and immediately said to my wife, “Oh my God, this is the marble!” She looked at me a bit strangely, but sheʼs used to me. She knew a story was fast approaching. Brendanʼs gift was inspired by a Junior Great Books® selection, “The Secret Lion,” by Alberto Álvaro Ríos—an especially appropriate story for middle-school children. It is a story of transcendence, a coming-of-age story in which childhood is juxtaposed with the realities of adulthood. The boys in this story find a grinding ball, a metal sphere used in mining to grind ore, while exploring an arroyo. When they lose the ball, something special, in their eyes, is lost. The symmetry of this object is a metaphor for what the boys perceive to be perfection. In many ways this story is reminiscent of what Alice experiences in Wonderland, a world in which childhood and adolescence collide. The boys explore their own wonders in the arroyo. It is their childhood Wonderland. Here they can scream and shout whatever they want. It is their sanctuary from the adult world. It is perfect. As the story unfolds the boys venture off to the mountains, where they happen upon emerald green hills. This new oasis turns out to be a golf course. Their eventual realization that this emerald green oasis is not nature in its pristine state is, of course, the wake-up call that rivets them to the adult world. One of the most pivotal lines of inquiry for the story is the question, "What did the children lose?" As with all Junior Great Books units, we had many opportunities to share our comments and observations about the reading. Brendanʼs class had been given prompts and questions for their writing journals. Then it was time to put our thoughts into writing. What I enjoyed most about these pieces was the stories my students shared about their lives and how they connected different facets of the story to their own experiences. I imagine that children since antiquity have enjoyed the stories elicited from the adults in their lives. Storytelling is a rich tradition and blends so well with reading. One of the stories I shared with Brendanʼs class was a time when I, too, had lost something perfect. It was a brass marble, won on the elementary school ground and lost while I walked home along a country road, rolling it and chasing after it repeatedly. This game ended when on one precipitous roll the brass marble disappeared off the side of the road. But it returned because of Brendan. It now sits under our Christmas tree—indeed, the first gift of Christmas. The brass marble will always remain a cherished reminder of the most perfect place I could ever have been: the classroom. Sometimes the greatest gift of all is the kindness that resonates from the stories we share. Frank Calderale recently retired after thirty-nine years of teaching. Frank was one of the founders of the Shoreham-Wading River Middle School, which opened its doors in 1973. The SWR Middle School was founded as an experimental middle school under the leadership of Dennis Litky; it implemented and developed many innovative programs. Frank has seen many changes in education during his career, but his extensive use of Junior Great Books and its core curriculum has served him as a template and a beacon. Frank enjoys fiction and nonfiction reads, as well as long days outdoors. 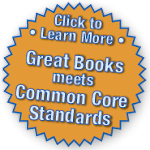 For 50 years Great Books programs have helped students achieve what the Common Core State Standards now demand. Wait I Have A Blog?! The Great Books Foundation©. Picture Window theme. Powered by Blogger.